RadioFreeLiberal.com • View topic - Let the Oscar(tm) Festivities Begin! Let the Oscar(tm) Festivities Begin! Post subject: Let the Oscar(tm) Festivities Begin! 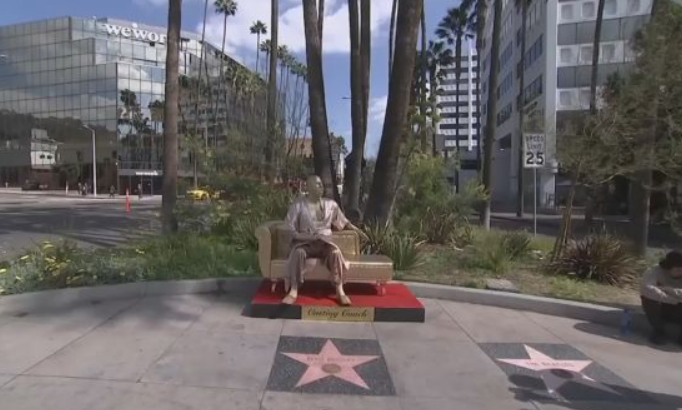 News photo: gilded statue of Weinstein materializes in Hollywood. Allegedly by street artist Plastic Jesus, paid for with donations. Out of frame below is a gold and red sign saying "Casting Couch." Note how the position in which the figure is holding the Oscartm. Also note the background palm trees, the CBS news van, and the hyperventilating woman on the billboard across the street. I also like the message on the guy's shirt. Interesting detail is that this is not today's weather in L.A.. I checked the radar, and it's raining everywhere (noteworthy in itself). But the story broke worldwide today. Post subject: Re: Let the Oscar(tm) Festivities Begin! Wider shot of the Casting Couch. It's hard to read, but I believe the stars in the foreground are for Elvis Presley and the Beatles. The location is Hollywood and La Brea, maybe 4 blocks from the Oscar(tm) venue. Credit unknown on this one. A man has been arrested on suspicion of stealing Frances McDormand's Oscar after the awards ceremony on Sunday. 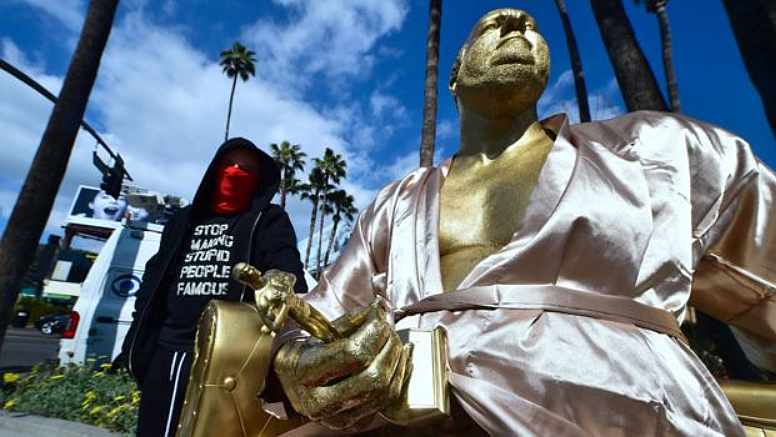 Los Angeles Police have confirmed Terry Bryant was arrested for grand theft, after the statuette went missing from the Governor's Ball. The 47-year old was booked and has had bail set at $20,000 (£14,400). He will attend court at a future date. The statue has since been returned to the best actress winner. The Governor's Ball feeds 1500. Wolfgang Puck caters it. It's at a prestigious Beverly Hills performing arts venue that we know only too well. I can't give details. James Ivory was a partner in the famous Merchant Ivory Productions, which made some of the absolute classic movies. Merchant Ivory was known for the highest quality product, much of which is timeless. It gets better. Merchant and Ivory were an LGBT couple (Merchant died in 2005). Openly gay writing award winners are rare, believe it or not. He might be the first. He's also way, way the oldest at 89. In a completely ageist business where 45 year old writers have to hire film students to front for them in pitch meetings, this is remarkable and I congratulate the Academy voters for showing some class and recognizing one of the greats. First Latino to win this award. Good choice. As an aside, he's also a teeeeeeeeny bit on the old side for This Town, but then anyone over 30 is a bit on the old side. Nice to see ageism overcome again. We hear about racism and sexism, which indeed are big problems, but ageism is perhaps the most ingrained. Pretend you're above the line for a second. For whatever reason, you become involved with the Shape of Water project. How long before you wake up sweating, when it finally hits you that you just signed on to direct a movie in which the lead is mute, and the romantic interest is a captured amphibious humanoid in a Cold War secret lab? You left out cinematography. I didn't see Blade Runner 2049, which apparently was a bad mistake. I hope I can stream it or..... (we don't talk about the alternatives). Roger Deakins is also a bit long in the tooth for this biz, especially in a job where it's considered macho to stay on your feet 16-20 hours a day. He's a great cinematographer but never won the Oscar. This was his 15th nomination. Another good recognition by the Academy. It seems that this kind of career recognition was as big a theme as the race/ gender/ age/ immigration inclusion thing. Dumb Oscar show, but one of the better outcomes. Last edited by ZoWie on Mon Mar 05, 2018 3:21 pm, edited 1 time in total. Yeah, BR 2049 won two awards. I did skip mentioning it (as well as a few award categories), which is too bad, as it is a long delayed sequel to one of my favorite films. As I'm sure you know, sci-fi as a genre rarely does well at the Oscars. I was impressed. It really does build on the PKD story in original ways, much as the 2nd season of Man in the High Castle did to the first. I want to watch it again. I do know that, and yes, I can't believe I didn't see it. The FX unit was huge and made something like 1100 shots.